Press screenings for the London Film Festival have been in full swing for almost two weeks now but I’m only just getting around to reviewing any of the films on offer because a) I’m faintly aware that the vast majority of you couldn’t give half a pair of shorts about films coming out six months from now and b) I find it quite hard to force myself out of bed for anything that doesn’t contain at least one recognisable face. Luckily, Like Crazy boasts Anton Yelchin, Felicity Jones and notorious parental-hand-severer Jennifer Lawrence, so I had no trouble getting myself down to the BFI for this particular offering. The film tells the story of a British exchange student (Jones) and an American furniture designer (Yelchin) who fall in love Sundance-style, i.e. 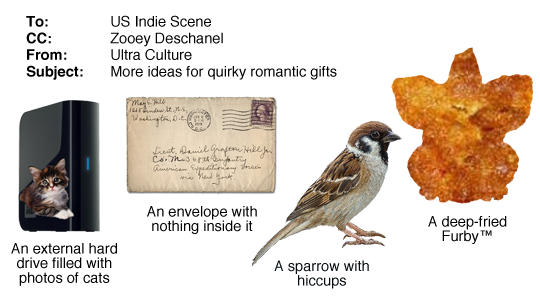 almost entirely without exposition, and then spend ninety minutes exchanging increasingly quirky romantic gifts. Things take a turn for the worse for our happy couple after Jones is refused re-entry into the US after overstaying her student visa. With her now trapped in London for the foreseeable future and Yelchin reluctant to relocate due to his successful furniture business, the pair are thrust headlong into the difficult world of long-distance relationships. Yes, this is First World Problems: The Movie. As good-intentioned as the film is, there’s something quite irritating about its stubborn refusal to really do anything, instead opting for a sort of vague ‘atmosphere’ that might see it bundled in with more successful indie dramafests like Blue Valentine. There’s only a certain number of times you can watch a couple lying in bed having a stilted conversation before you’ve taken pretty much everything you’re ever going to take from it. Which isn’t to say that Like Crazy is entirely devoid of merit: the performances are pretty solid and the final act does at least hint at having something to say (albeit in a slightly muffled tone of voice), but for the most part the will-they-won’t-they-get-that-visa-sorted narrative wasn’t quite enough to sustain my attention, and instead I ended up wondering how exactly Jones’s ‘professional blogger’ could afford to live in an EC2 flat that looks like it just fell out of the Habitat catalogue, or why both of them insisted on making international calls from their mobiles. HAVE THEY SEEN THEIR BILLS LATELY? It’s a madness.